Earthquake Prediction: Pakistan/Afghanistan/NW India: Earthquake Predictions for February 2017! 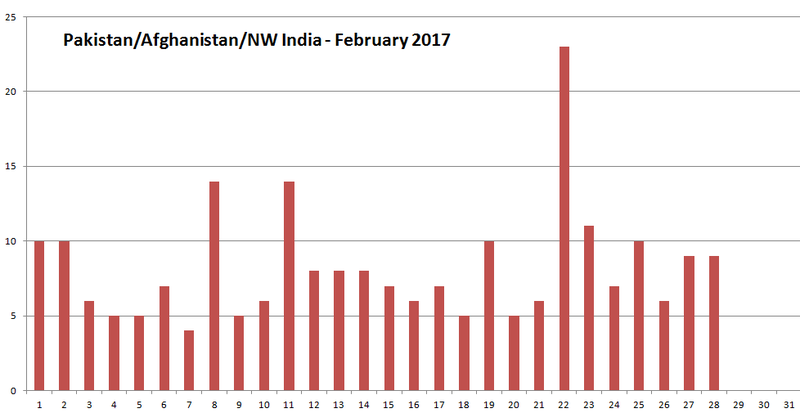 Pakistan/Afghanistan/NW India: Earthquake Predictions for February 2017! Based on our published reseach technique, we here apply it as a systematic predicting tool for determining the dates of earthquakes. Our methods are experimental and we test them in real time. In the following diagram we can see Pakistan/Afghanistan Earthquake predictions for the period of February 2017. For this period we observe that there is a Small-Medium* probability to have an earthquake >4R in the region of Pakistan/Afghanistan on 8th 11th and 22nd February 2017, according to our methods. For other dates see chart below.